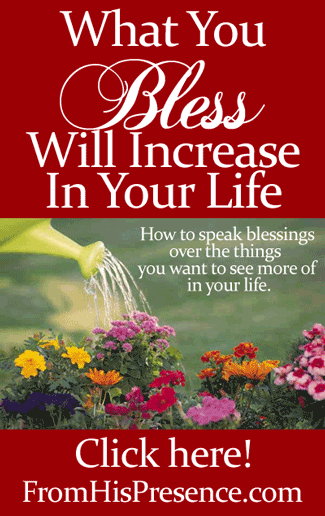 One of the governing principles I live by is that what you bless will increase in your life. I first heard about this principle when I listened to a sermon by Chris Gore from Bethel Church in Redding, CA. It intrigued me because it made perfect spiritual sense. So I thought I’d try it out. Great feedback in the workplace, etc. So wherever I’ve noticed things in my life that I want more of, I’ve been blessing them. I also make sure to thank God for each of the things I want to see more of in my life, because thanksgiving brings increase as well. And sure enough, it works! Whenever I thank God for something and speak a blessing over it, I see more of that thing–sometimes immediately! Blessing something is just like watering a flower. If you water a flower, it will bloom. When you speak blessings over the things you want to increase in your life, you are watering those things, and you will actually see them bloom! The things I bless increase continually. This stuff really works. Are you skeptical? Why don’t you try it and let the results speak for themselves? You have nothing to lose. Identify several things you experienced during the last few days that you want to see increase in your life. Bless them right now, out loud, just like I did above. While you’re at it, thank God for them (because thanksgiving honors God and will also bring multiplication in your life). Keep doing this as you notice more good things happening. And you will see increase. It works every time, because blessing God’s work in your life honors Him and opens the conduit for Him to bless you more. Have you ever noticed this principle working in your life? If so, please leave a comment and tell me your thoughts! Aww, thank you so much. I praise God with you! And I’m trying to be more intentional as well. 🙂 Thank you for reading and sharing! Thank you Jamie for this blog. Praise God! Thank you so much, Chinny! Wow Chinny, I stumbled onto this wonderful site yesterday, and I am so thankful the Lord directed me here even though I was unaware of His leading. I too, am sharing this site to friends and family. It’s so true that when you Thank and Bless the things you’re lacking in, you see an increase. I’m an impatient driver. When I started giving way to other motorists for example, I get the same treatment from other drivers and almost at times instantly just round the corner.. I am praying to own my own place and so I give to homeless by way of donations and I offer my home to 2 stray cats that would be hard to have forever homes bcoz they are 5years old and not kittens. I know they’re not humans but I can’t offer my home to strangers but I believe God sees the act of Faith. God is Good, He has given me more than I will ever deserve!!! I have never tried this but as of to day, l Will can’t wait to see how God move, Thank you so much for the incourgment, you are a blessing from God. Hi Jamie – do you have a scripture/s that confirm this word of yours? Effective principal I am sure … But always appropriate to provide spiritual back up from the Word in confirmation thereof. Hi, I just discovered your blog and I really like it. It has been two years since I received the Baptism of the Holy Spirit and since then Im on a journey and a path of hunger abour God, and his power to us his sons. About the power of blessing, can you please provide me with some scriptural references about it? I just “discovered” Luke 9:16 as some scriptural backup for the power of blessing, but if you can give me more backup I think it should be great! Greetings and blessings from México! This is exactly what i wanted !!! I pray the Jabez prayer for you and the team..
Keep you from evil so it may not harm you .. May His Name be on you and all the things you do ..